The iPhone ringtones seem surprisingly cheesy. 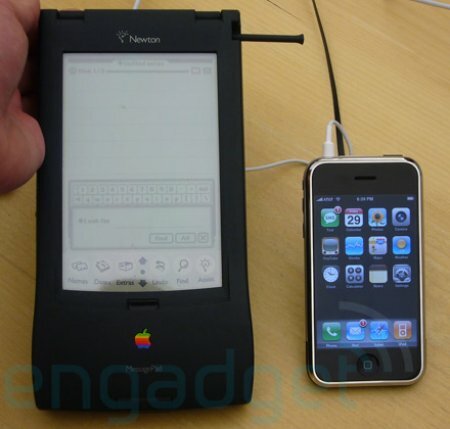 Engadget: How far we’ve come. I can understand needing higher-quality headphones, but why the hell would anyone want to use mic-less, remote-less headphones that aren’t designed for the iPhone? Could it be that they did this for durability? The iPhone is a high-end device that may not have the same planned obsolescence that iPods do (they do instruct you that you’ll have to send them in to replace the battery in two years, don’t they? so they assume you’ll want to keep it longer than that), and recessing the jack output so that the headphone plug is firmly held in place by the iPhone’s bezel itself should avoid putting too much strain on the output’s solder points when the phone’s in your pants pocket with the headphones plugged in. Keypresses are registered on release, not on press. So if you miss, you can roll around the keyboard until the right key shows up and then let go. Amusingly, web pages with the most flexible layouts (say a table with a single stretchy column) have the most trouble adapting to the iPhone usage pattern. I’m now officially announcing that all my websites are optimized for iPhone. I just had an interesting experience this morning where I was browsing a page on the phone that linked to a YouTube video, and I thought “man, it would be awesome if it actually loaded this in the YouTube app rather than taking me to a web page with a non-functional Flash viewer”, and lo and behold that was exactly what happened, and I squealed with glee and startled my dog. 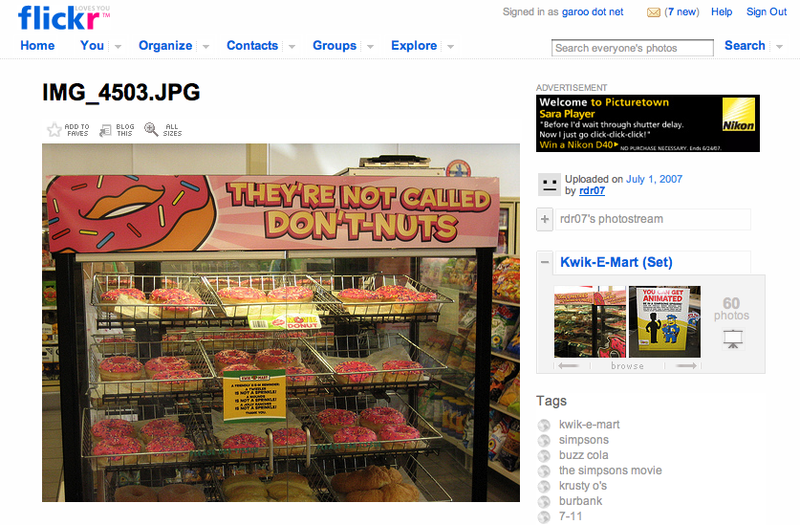 While browsing a Kwik-E-Mart set [via] on Flickr I’m amazed that they’ve switched to the dark side: not only do they have ads (of the ugly kind — white and yellow on a black background, which sticks out much more than needed on Flickr’s white pages) but they’re inserted sometimes over the navigation buttons, so that you can’t repeatedly click the prev/next buttons without looking because they’re not always at the same spot anymore. I hope there’s an ongoing user revolt about that. As the user presses down on the “D” key, for example, a bigger image of the “D” key in a dialog balloon, as in a comic, appears just above the finger. Unfortunately, as far as I can tell, the balloon can only be made to display once the user had committed to the letter, thus acting to announce errors, rather than prevent them. If users are hovering over the wrong key, they can slide their finger left or right while still maintaining contact until the desired key appears. Followed by a semi-valid explanation of why that’s wrong, mostly based around the fact that he’s offended he didn’t realize that by himself. I already wrote that I was astonished some of the iPhone’s functionalities were so unintuitive anyway. How come did I notice the change? Well, I’m one of those who did click his contact link to let him know (I happened to read his column just minutes after I blogged about the feature). And if I weren’t, how would I know about it? Why, I wouldn’t, because there’s no mention whatsoever of reader input — or of the column being updated at all, for that matter. Now, there’s a chance that he might have noticed by himself before he had an opportunity to read his e-mail, and change the writeup. But it’s hard to tell, since there’s no mention of the update itself, or that he was ever wrong about that (ah, hubris). And, even if he had stumbled onto it himself, you don’t write “let me know if I’m wrong,” then silently fix your column with no mention whatsoever of receiving mail about it. I’m curious how smartphone sales in Europe will evolve over the next few months, now that we got a virtual taste of the iPhone. Steve Jobs has relaunched Apple, created the song download market, climbed his way onto the top of the Disney empire and is currently attacking cellphone manufacturers head-on. You know, if I were the biggest player in a diseased market managed by a handful of clueless corporations, I would really not be trying to piss him off and give him a reason to really go for the jugular. But then, I did mention they were clueless. Remember that the final licensing agreement between Apple Corps and Apple Inc finally lets them publish music. But then I could never understand the rationale for application icons and utility icons being seen from a different angle. It’s infuriating when you’re trying to do something on two computers simultaneously, and they both start lagging. Hmm, Twitterific is skipping messages. When they announced Pownce, I wrote that I didn’t believe in the idea of a Twitter with more options, because the whole point of Twitter is precisely its simplicity. Now that I’m in the beta (thanks, T.), I can confirm my intuition: the home page feels much too complex, and less friendly, than Twitter’s — too many options, too many menus. Contrary to what I thought, though, the ability to post text, links, files and events works well: the interface is reminiscent of Tumblr’s with pseudo-tabs above the form that let you switch between modes. And you’re not going to get it wrong — you’re not going to accidentally use the event form to post a link, since the fields are not the same and the difference is quite visible. But that’s not the case when it comes to choosing who will receive your pownce: sure, when you look at Twitter, you think some granularity would be nice, but it’s actually a bad idea that only creates confusion. In the web version, the form doesn’t remember the previous recipient, so that you’ve got to pick “the public” every time you post, if you’re going to be tweeting; in the desktop version, the previous recipient is automatically selected, so that I already sent a message to the wrong person once, even though I only posted a dozen pownces in all. There’s just no good way to offer that choice, because a select box is a wrong interface for something you’ve got to input every time (it’s not visible enough, too easily forgotten) and there’s no possible better interface (you’ve got to list every contact and every group). That doesn’t mean Pownce can’t be good at something — just that it’s not a good Twitter replacement (unless you factor in Kevin Rose and Digg’s weights, which might tip the scale): it’ll never be as accessible, intuitive and natural. Even though Pownce is prettier and doesn’t limit message length (but is that an advantage? sure, the limit is sometimes frustrating, but it’s a really interesting incentive to think twice about what you’re posting and the best way to pen it). Where Pownce might shine is as a mini groupware solution, letting you sync calendars and share files with your partners on various projects — whether you’re organizing a group blog or podcast, or you’re a student with group projects. In that case it’s not about telling the world how you feel in the most organic way, but just having the most convenient solution to share data, with a purpose. 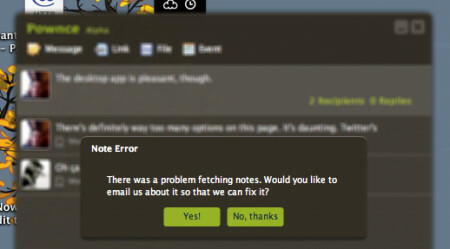 And, for that, Pownce is definitely more efficient than email (once you made your partners register too). It will all depend on how they target their network — and I’m unfortunately not sure they actually know who they’re going after, and the home page makes a lot of references to “ your friends, ” so we’ll just have to see if the beta lets them realize what their creation can actually be useful for. Because it sure doesn’t look like they have any idea for now. Pownce isn’t Twitter, or Facebook, or Blogger or Tumblr; there’s a very viable market in students needing a groupware solution that’s both cool and simple, but the site’s creators will need to know what they’re selling them. Aaaahh! Last time I went on my bed with my MacBook (which doesn’t happen very often and, yeah, I sometimes wonder why I’ve got a laptop) the wifi connection dropped after a few minutes. Repeatedly. Well, turns out it wasn’t me, but 10.4.10 [via]. It seems like the problem is more prevalent when you’re very close to the access point. Away from it, the signal doesn’t drop anymore. I guess that’s a sign I should get a move on selling my laptop. But the MacBook hardware has evolved so much over the last six months, I’m afraid how much value it lost. Plus I like my Bradshaw and I don’t want to get rid of it. Oh! Full-screen playback in QuickTime is free, without having to wait for, and buy, Leopard. That’s pretty cool. Better late than never, they say. Well, it doesn’t exactly make up for all these years, but it’s still a pleasant surprise that they’d update that in Tiger. And anyone who used QuickTime Player had already hacked it, anyway. A good example of using nature photography as inspiration for color palettes. What these stories miss is that, hour by hour and minus expenses, blogging is a fairly low paid job considering the high caliber of the people involved; the really smart kids are building the startups, not writing about them. The [iPhone] feature that is designed to dial any number displayed on a Web page after a user taps it is subject to various attacks, including cross-site scripting and drive-by downloads. A very good rationalization of my gut feeling that offering more features, like Pownce does, does not help. “More prominent”? It took me five minutes to find the new, misplaced “follow” button on Twitter pages. “On s’intéresse aussi aux parisiens qui n’ont pas les moyens d’avoir un internet chez eux” et qui ont un MacBook. Et ne surfent pas la nuit. Just realizing it’s a good thing I can’t have an iPhone, because I’d have to switch from NetNewsWire to Google Reader. MacBook Pro 85W adapter shrunk: I bought an 85W adapter for my MacBook because they’re known to be cooler; I wonder if that’s still the case now that they’re condensed. Sent from my iPhone. Nyah nyah. I don’t get that people expect Typepad et al. to have enough power backup to hold during a 3-hour outage. Hospitals need that. Not websites. Wasn’t releasing the iPhone two days before the quarter’s end a tactical mistake? Or the kind of gamble you can’t quite win? Crap, Photoshop’s stupid French version is giving me bad keyboard shortcut habits. Just realized the $499 Mac mini disappeared to make room for the Apple TV. One of the pictures shows a “Not cosmetic unit” sticker, implying that the keyboard is a functional prototype but the finished product won’t look exactly like it, so I guess it’s credible. 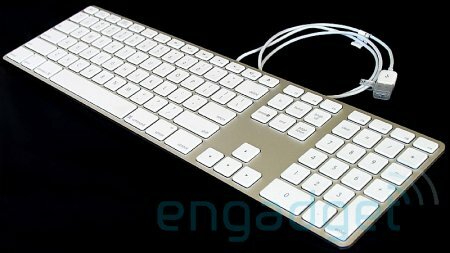 The function keys are weird, though: why would the volume keys, and new iTunes control keys, end up where Exposé is triggered (if you’re looking for the “fn” key, it’s replacing the current “help”) and leave F13–F19 free? (Uh, F19?!) Unless they’re just trying to confuse leakers. Leopard 9A499: sadly, the transparent menubar isn’t going anywhere. Incidentally, if Apple needed to redesign system icons to fit the new menubar, all existing third-party extensions will look like crap (assuming they still work — menubar icons were never officially supported in the first place). Google’s Number One UI Mistake. Nevermind that I don’t use the “I’m feeling lucky” button; for the first few months of using Google, I just assumed it had to be an ad that would take me to an online casino or something.